This is the best sound that’s perfectly enough to kick off the new year as we are celebrating the new year 2k19 today. 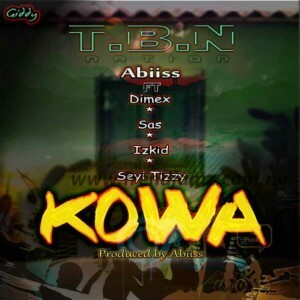 TBN nation signee, Abiiss linked up with super talented artistes to comes through with a new year jam titled #KOWA featuring TBN boss – Dimex, Demon Rapper – Izkid, Superb Talented kid – SAS TBN and the sensational singer – Seyi Tizzy. The song was produced by Abiiss and mixed by Dimex. Trust me, This is surely a New Year anthem that will soon take over everywhere !